This double pendant item can be personalized with any name on the main pendant, and any of the quotes shown on the accent pendant. 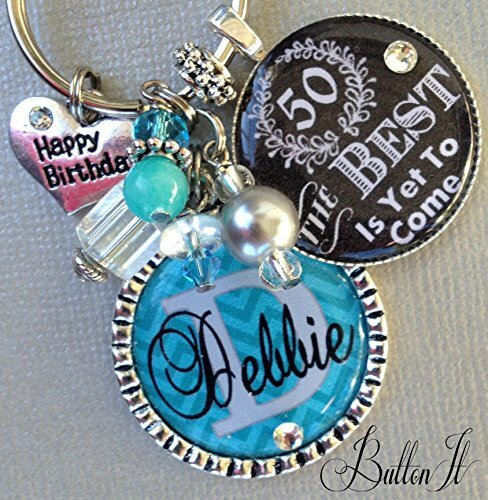 It is available on a key ring with a large lobster clasp, or on a 24" ball chain necklace. The silver-plated pendant is 1 1/4", and is accented with various beads and crystals that will vary slightly. It will also come with your choice of ONE charm. The bezel comes with a water resistant, not water proof resin, and comes in a gift box tied with tulle and a decorative ribbon. All material copyright ButtonIt 2008. All rights reserved. If you have any questions about this product by ButtonIt, contact us by completing and submitting the form below. If you are looking for a specif part number, please include it with your message. Keychain. Wrestling Charm. Wrestling Mom, Wrestling team gifts, Gift for Wrestler, Be Badass Every Day.